My flagship project is to liberate election data from every state of the United States and publish the data onto a robust web software platform I designed and developed: ElectionStats.com. Liberating such comprehensive data at such a fine level is an unusual achievement that can be used to generate some powerful insights about the state of our democracy at varying levels of geography. One insight is that of competition. There are colorful charts that appear to indicate how many candidates ran in primary and general elections for the particular district you are looking at. In this regard, Massachusetts is abysmal, with about 8 out of 10 state representative races going uncontested. The software has been built to be “pluggable” with election data from other jurisdictions. The plan is to continue to bring new states online as quickly as possible and make this not only the most intuitive software tool of its kind, but the most comprehensive in its data offering. As part of my advocacy for Ranked Choice Voting, I set out to scour the state’s official election books in order to determine the extent of “minority-winner” candidates, aka, candidates who win elections with less than 50 percent of the vote. In the process, I stumbled upon a treasure trove of PDF files at the Massachusetts State Library. Apparently, the library had received a grant in order to scan and link as PDFs every single edition of these books, which are published every two years and date back to the late 1800s. Using a combination of optical character recognition (OCR) programs, I was able to scrape the data out of these 500+ page volumes. I scraped over twenty books, over 10,000 pages in all, starting at 1970 and proceeding up to 2000. Koczela, Steve. “Not exactly party time in Massachusetts: the number of unenrolled voters is climbing to historic highs.” CommonWealth (Summer 2014). Benson, Brent. “An updated partisan ranking of Massachusetts state representative districts.” Mass Numbers: A quantitative look at Massachusetts politics and policy (May 27, 2014). Koczela, Steve. ”Boston’s Challenge for the GOP.” CommonWealth (Spring 2014). Koczela, Steve. “Where are the most ‘swingers’ in Massachusetts?” Commonwealth (February 7, 2014). “The strange tale of Congressman John Arden.” MassINC Polling Group (December 16, 2103). Schoenberg, Shira. 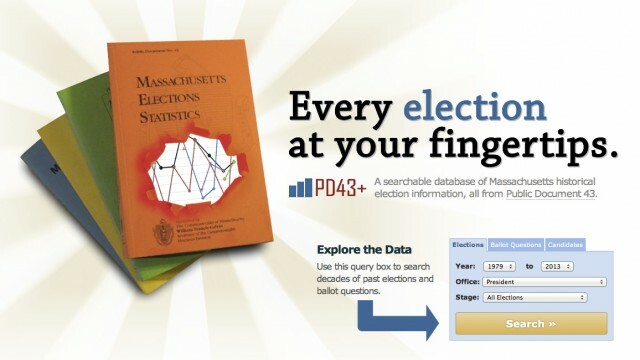 “New websites provide access to Massachusetts political data.” MassLive (February 21, 2013). “Politics in the Blogsphere.” Mass. Political Profs (February 20, 2013).